Home / LIFESTYLE / REVIEWS > / FILM REVIEWS / A retired widower tries to find happiness, but will the target audience? 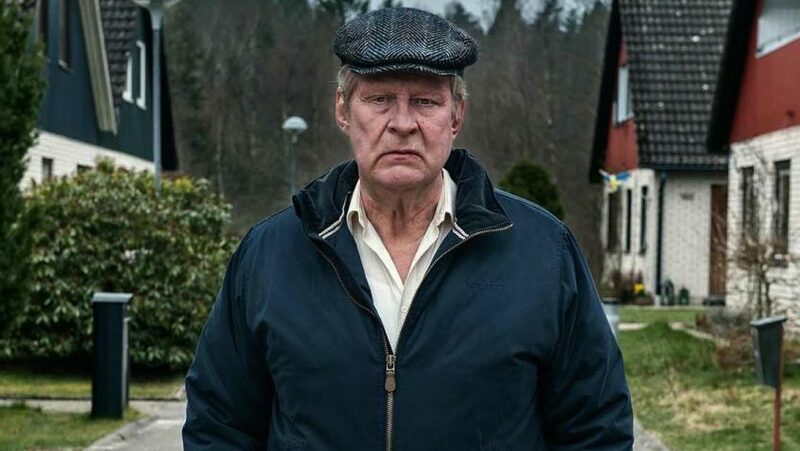 A Man Called Ove (En man som heter Ove) was not only nominated for an Academy Award for Best Foreign Language Film this year, but is, according to Wikipedia, the third most watched film in Sweden of all time. To put it in context, the Swedish people preferred ‘Ove’ to most of Ingmar Bergman; to Lukas Moodysson’s Together, to Lasse Hallström’s My Life as a Dog and to Ruben Östlund’s 2014 drama Force Majeure (deservedly nominated for An Academy Award). 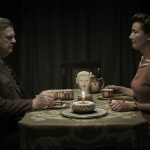 Up to a point, you can see why Hannes Holm’s morally and romantically appealing comedy about an older man learning to love again would pack in the crowds. But when you start counting the clichés and predictable moments; when the main character’s curmudgeon mode seems mannered; and when the humour loses its edge, it becomes more difficult to understand the acclaim. Adapted from Frederick Backman’s Swedish best seller, Ove Lindahl (Rolf Lassgård) is distraught over the recent and untimely death of his wife, a school teacher named Sonja (Ida Engvoll). When you see the delightful flashback scenes chronicling the love story between the awkward, shy, nerdy Ove (Filip Berg) and the sophisticated, bubbly student teacher with the great sense of humour, you will be too. For without Sonja, the older Ove is a tiresome, critical, busybody and we see how she brings out the best in Ove and helps him in his 43-year career. You cannot, however, imagine that the young man in the flashbacks would have grown into the curmudgeon of the present day particularly while Sonja was alive. And that is one of the problems with Ove’s character. At 59, he is not really old. And that it takes him only 6 months from Sonja’s death to become an argumentative, mean (he argues with a young sales attendant about a 2-for-1 deal), authoritarian, bitter loner is problematic. We know why he is like that: the character arch demands that the character be redeemed. After all, we’ve seen this type of character in films like St Vincent, Up!, Manglehorn and Clint Eastwood’s 2008 film, Gran Torino. If, as in those films, Ove’s attitude is partly a defence mechanism, the character development in Ove’s present day story is more contrived than credible. Recently retired from his job as a railway engineer, Ove prowls the gated community for fag ends and open gates. He insults an inbred dog peeing on the tiles (‘That’s not a dog; that’s a winter coat with eyes.’) but, to his credit, cannot tolerate animal cruelty either. He has been feuding with wheel-chair bound Rune (Börje Lundberg), his former best friend, since Rune replaced Ove as head of the residents’ association by a landslide vote. When a pregnant, Iranian immigrant Parvaneh ( Bahar Pars) moves across the street with her Swedish husband and two children, Ove’s curmudgeonly nature is firing on all cylinders, even venturing toward bigotry. Naturally this family is friendly to a fault, generous (the cute little children bring Ove a home cooked meal), and begin to treat Ove like he is their grandfather. Parvaneh even hires Ove to give her driving lessons, an episode worth a few good jokes. Those who saw Gran Torino, however, will experience déjà vu, for this is precisely the relationship between the lonely car mechanic and the Asian family next door in Gran Torino. The relationship there was handled with more subtlety and Eastwood’s Polish car mechanic, Walt, is more credible at 78, than Ove at 59. The similarities do not end there. Ove is as much a stickler for Swedish cars as Walt is for American-made cars. When Ove bought a Saab, he tries to overlook the fact that Rune, a new friend, could have bought an Audi. They bury the hatchet, and then Rune turns around and buys a BMW. Ove talks out loud to Sonja in an expository fashion when he lays flowers on her grave. He utters apologetically, ‘This is the first time you’ve had to wait for me.’ Annoyed at himself that their reunion is taking so long, Ove tries to kill himself throughout the film and we are meant to laugh at the various attempts until, predictably, nature takes its course. The first suicide attempts are hanging, with Ove, dressed in a suit and tie, turning the lights out to avoid wasting electricity. Then he tries carbon monoxide poisoning and so forth. Most of the interruptions come from Parvaneh and her family, giving Ove another reason to be grumpy. Holm finds in these suicide attempts a clever structure in which to reveal Ove’s past, but, like everything in the film, there are diminishing returns. While waiting to die, key moments in Ove’s life flash before him. The wonderfully assembled flashbacks give us a completely new angle on the man, so much so that it becomes increasingly difficult to believe in the man he has become. By far the most enjoyable scenes in the film tell the romantic story of how, after the house he inherited from his late father is allowed to burn down by the vindictive local council, Ove, left homeless, falls asleep in a train. When he awakens, he sees a red shoe and follows the attractive leg it is on up to a lovely, radiant face. When a mortified Ove realises he cannot pay his train ticket, this passenger buys him a ticket in exchange for a dinner invitation. There are moments when Holm manages to inject the charm of these scenes into the present story, such as when Ove, asked to baby sit, ends up repairing Parvaneh’s refrigerator. But for the most part, you can see it coming a mile away.